Sometimes it’s hard, to misquote Tammy Wynette, to be in publishing. There’s so much talk about the opportunities opened up by the digital revolution, but most of it is set against a background of change in which the struggle for readers and sales is greater than ever. But for me, there’s one digital-age development that stands out as an unqualified opportunity: the rise of the midform. Shorter than a book but longer than an article – generally 5000-30000 words – the digital short is becoming an increasingly popular format for writing historically ruled out by the economics of publishing full-length print books. Now pieces whose natural length meant they saw the light of day in collections of short stories or essays, if at all, have found their form. It’s not hard to see why the digital short suits the needs of the times. For writers and publishers, it requires an investment of time and resources proportionate to the likely rewards of certain projects; for indy authors it accords with the marketing practice of selling multiple, linked products and ‘cross-fertilising’ sales with giveaways. And it offers on-the-go readers the satisfaction of finishing something on their tablets within a train journey or two. In non-fiction in particular, the emergence of the digital short represents a liberating trend. Figures on the decline of authors’ incomes show that, on average, writers of non-fiction earn half of the revenues from fiction, with travel and academic writing paying the lowest of all. It’s not surprising, then, that the digital short is finding favour in academic publishing, providing scholars and presses with a handy format to get research out into the world quickly, and in a form more accessible to readers than a full-length monograph. In my own genres of travel writing and reportage, there are signs that the digital short may provide part of an answer to the challenges. Traditional travel writing is notoriously consumptive of time and money – the research and trips involved means that a full-length book usually takes years to produce, and that’s without counting the publication and marketing processes. And twenty-first century readers have many ways of learning about far-flung places other than investing hours reading lengthy armchair accounts of journeys by others. The crisis in journalism, meanwhile, has cut pages and budgets for foreign affairs, with the result that there are few outlets in which to publish in-depth writing about the wider world. In this context, an economical digital read – short in publishing terms, longform if viewed from journalism – is a less daunting proposition. 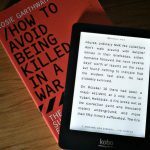 The ‘reporting’ category of Kindle Singles is host to pieces of reportage that would never find their way into a news paper or website. An early success story comes from Libya with The Shores of Tripoli, while A Syrian Wedding reveals how life goes on amid one of the world’s most intractable conflicts. Beyond Amazon, a range of sites are bringing the articles that magazines now rarely print to a readership hungry for longer reads. My own first foray into midform led me to hope that the ‘travella’ – my name for a midform travelogue – may help to save the genre from extinction. To be sure, the digital short throws up marketing challenges of its own. As Joseph Esposito points out in this excellent piece, the original short is particularly hard to publicise because, as a standalone, it has to make its way amid a sea of other digital-only publications with any connection to what’s already out there. Hence the appeal of ‘chunking’ – the breaking up of a full-length book into publications on specific subjects which can then be marketed to niche readerships. Chunking was a natural next step for me when I released sections of The Secret Life of God on monasticism, Sufism and Druidry for readers interested in particular aspects of British religiosity. The approach effectively constitutes a sibling trend of post-publication serialisation which, as award-winning author Victoria Noe describes, helped her find readers for her niche writing on grieving for friends. This piece was originally published in the Self Publishing Advice Center of the Alliance of Independent Authors.